It snowed Thursday night. We knew cold was coming, though we were not expecting SNOW. In September! During the day, I had harvested all my herbs and peppers and transplanted basil, thyme, and parsley plants into pots which I carried indoors for the winter. And the jalepeño plant. I don’t expect it to continue producing through the winter, but it is such a beautiful plant. But my tomatoes! I have another tomato jungle this year, two raised beds full of towering plants heavy with gorgeous green tomatoes still on the vine. I could have picked them green, or pulled the whole plants to hang, but I really didn’t want to do either, since these autumn cold snaps are briefly brutal and then the temperatures head back into the 70’s for weeks until Real Winter hits. 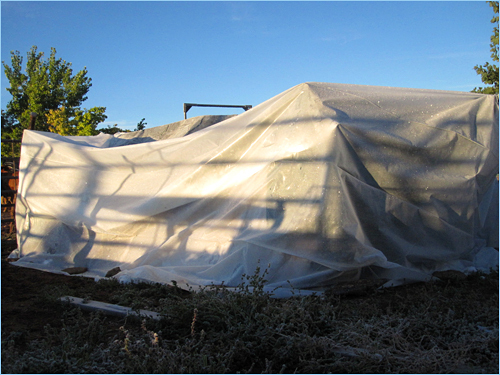 So, Thursday evening, I covered my tomatoes, as the forecast was calling for rain and mid-30-degree lows. Eli meowed at the door at ten or eleven that night, and I opened my door to a snowstorm. I was concerned about my tomatoes, but not worried – it was just barely freezing, the plants were covered, and generally, it’s not coldest while it’s snowing – it’s coldest once it stops snowing. It snowed through much of Friday, but was obviously going to clear off by sundown, which was when the real tomato-killing cold would arrive. 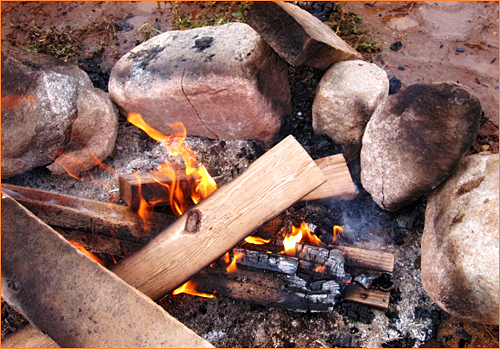 Friday afternoon, Mike and I piled up some granite boulders and built a bonfire around them, to heat the rocks. At dusk, just as the snow was tapering off and the cloud cover was dissipating, we moved the hot rocks (wearing heavy leather gloves) under the tarp and into the tomato garden, and placed them between the raised beds. I tucked the tomatoes in for the night and hoped for the best! The next morning, I walked up to the garden at dawn. The temperature outside was 28°F. Frost coated the grass, and the tarp itself. I wanted to measure the temperature inside the tomato tent but didn’t dare disturb it so early, so I just slid my hand inside – and it was noticeably warmer. 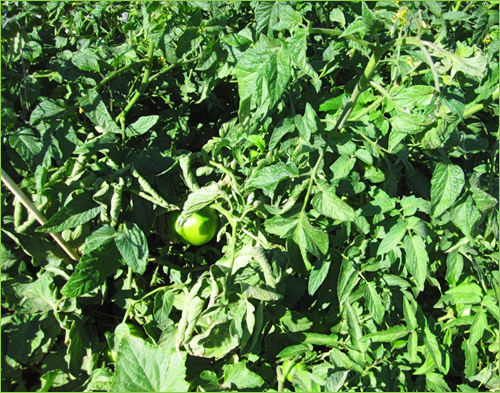 Around 9:30am, the sun was bright and the air temperature had warmed well above freezing, so we unveiled the tomatoes. LIFE! Success!! They survived beautifully. It’s back in the 70’s this week, so my zillion remaining green tomatoes will have a good chance at ripening, after all. Very resourceful solution! I would never of thought of that! That’s a great idea! If those had been my tomato plants, the poor little suckers would have died long before I got brilliant idea to use rocks as space heaters. Congrats on your quick thinking and ingenuity. Enjoy your fall tomatoes! So glad you kept the snow down there! We got it in the mountains but just frost here in the city and only on the roof tops. Glad you could save the tomatoes as there is no comparing a store bought one to a vine ripened one. Not looking forward to winter although I love Fall, the colors are amazing and are usually set off by the most glorious deep blue skies and unusual cloud formations. The frost does make for interesting photos doesn’t it. Those really are towering tomato plants!!! Did you post anything on how you got the beds started, because I surely need to do the same. 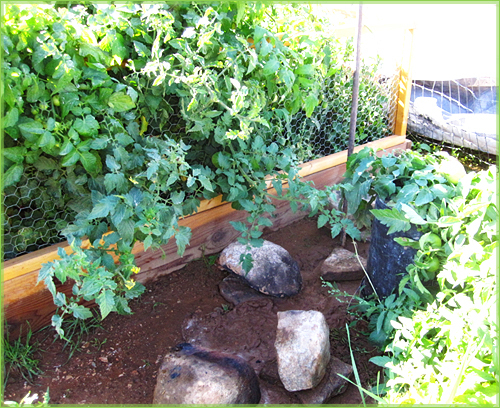 I live in a very, very wet area – so drainage is usually the problem – but I’ve never gotten my tomatoes to go crazy like that! ONLY SHREVE!!!! You never stop amazing me….from (presumably) ‘city girl’ to this ever innovative country girl with a true frontier woman’s spirit, never giving up, always finding ways to deal with anything and everything: from your farmily-animals to your farmily-farm and with all your endeavors in between. Looking so much forward to your next book! I tried it this year and it has been so easy. I still have tons of tomatoes! 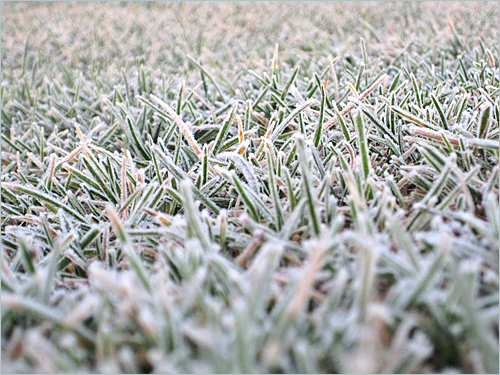 We haven’t had that kind of cold here in Kansas yet, but with this type of garden, covering it is pretty simple. Nice job! What a great idea!! OH YEA!!!!!!!!!!! You saved SUMMER!!! 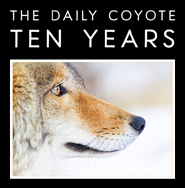 for just a little longer…. What a great idea! Glad it worked. Hawk ~ I never did, though I plan to blog it next spring. I made my own dirt and it was incredible: equal parts sand (from a neighbor’s gravel pit) + composted manure from our corrals, with straw mulch on top and a few applications of chicken poop in early summer. The plants LOVED it. Also – all comments are going straight to spam again so I have to manually approve them while I sort out this glitch – SORRY! I was wondering, were any of the rocks still warm in the morning? M ~ I actually didn’t touch them to see! Should have. But the ground around them, which was super muddy when we laid them down, was dry in the morning. So very cool, Shreve. Seeing your success with saving a very worthy looking and large set of tomato plants has just made my morning complete. My own tomato crop this year has yielded so much and I’ve canned, frozen, and cooked up enough that I think I can forego the plant covering. Well, at least I say that today on a beautiful sunny Eastern Nebraska day! Forget the tomatoes, what is this I hear, my Eli was outside in a snow storm ? What a wonderful idea! Glad it worked! My mom pulls “green” tomatoes at first blush and they ripen inside just fine. You can also make excellent chow chow from green tomatoes… and fried ones are a gift from heaven! great idea — a tomato sauna! every year we do what has become known as the tomato run: we are about to head off to bed when we realize how quickly the temperature is dropping outside. so we run out to the garden, cut all the tomato plants off at the base, and then run back to the house and hang them in the basement. the tomatoes gradually ripen on the vine over the next three weeks or so. very handy snacks. THAT’s GENIUS!!!! I’ll have to remember that one! Writing from Wisconsin; i keep jalapeno plants indoors throughout the year, in sunny windows. They produce just fine, but you will probably need to pollinate them (a clean fingertip works). Great idea with the tent, and i always enjoy your pictures! You are quite the problem solver! I learn something often from you. And let us not forget the gorgeous pics! Love the creativity and the “Que sera, sera” attitude you have. And congrats on helping the tomatoes thrive. I never cease to be impressed by what you do to achieve your goals. Happy fall! This is the sort of thing a small grower can do that the mega-farms cannot. You can’t get much more local than growing your own. I just got a small raise. That means I’ll be able to start building my raised beds over Thanksgiving break. I won’t have to worry about much killing frost in San Diego. If you stack the rocks in groupings they will hold their heat longer by preserving it in the one next to it. Quite industrious of you Shreve! Glad it worked. Our tomatoes basically drowned this year in Northwestern Pennsylvania. We had so much rain, most of them produced tomatoes that were rotten on the bottoms. Brilliant solution! 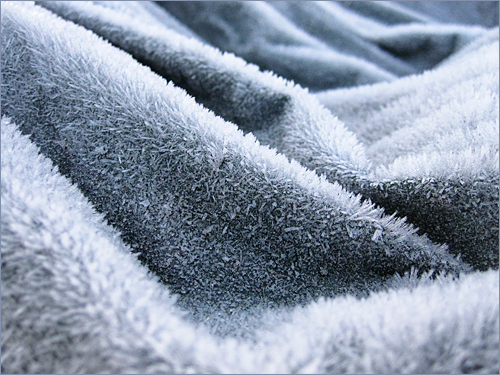 The photo of the frost on the tarp is fascinating in that it looks very much like a mircrofiber blanket -> warmth. Here’s hoping you get to enjoy fall for a bit longer, before the real winter comes! Only you would go to such lengths to save your tomatoes – and I mean that in a good way! :) Please post an updated pic when they ripen! 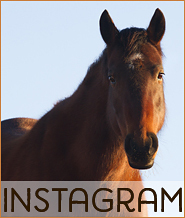 I love how your pictures tell the story with you. Great with saving the tomatoes AND telling us about it. And you’re about to get more! This is genius though! I’ll have to tell my family in WV! What a gal! What else is there to say? You honeyROCKdawn! Hooray! Fresh, ripe tomatoes – sooo worth the effort of heatin’ and totin’ rocks. I’m sitting here laughing and shaking my head. You and Mike are truly amazing!! Who would of “thunk”!! oh….. how are the maters now? what a snow storm! What a great idea! Enjoy those tomatoes. I do sweat lodges regularly and am amazed at what those hot rocks do. I put one in a towel in my sleeping bag on a freezing night and slept as deep as a baby ‘roo. See, I couldn’t have let them continue ripening in the first place. There’s nothing in the world better than fried green ‘maters. If I had a zillion of ’em on hand, I think I’d probably from sheer culinary overload.